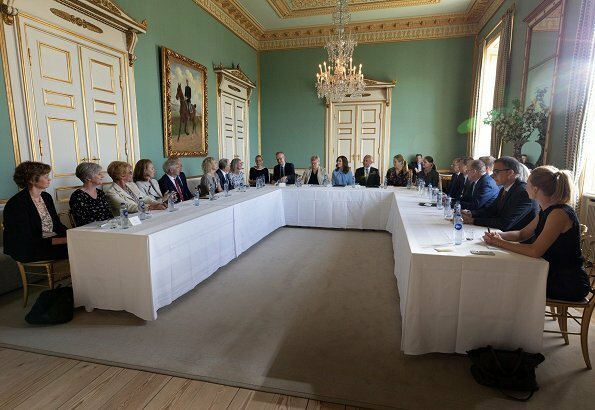 Today, Amalienborg Frederik VIII’s Palace hosted the annual executive board meeting of The Mary Foundation. 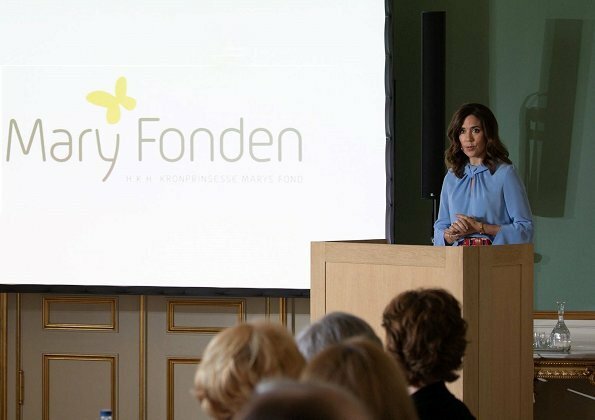 The board of The Mary Foundation held a meeting chaired by the Crown Princess in order to give detailed information to the Crown Princess regarding the activities, results, plans and projects of the Foundation. Mary Fonden ist eine Herzensangelegenheit der KP und war sozusagen ihr erstes Baby. Kein Wunder also, dass sie an dem Meeting teilnimmt, nach einer sehr arbeitsreichen Woche. Sie sieht etwas erschöpft aus, aber auch sehr schön. Die Bluse ist ein Traum. CP Marys blue blouse looks very good,I believe she is wearing a tan pair of slacks.Both look good so is her makeup. Love it...Love the design & color.